More than a few gardeners have been disappointed by "one-year wonder" tulips. These spring bloomers are perennials, but they don't always act like it-producing spectacular flowers the first year, only to peter out or disappear altogether the second. Here are a few tips to help you extend the life of your tulips and keep them performing for as many years as possible. When buying tulips bulbs, sometimes size can be a factor. Not all big tulip bulbs will be good repeat performers, but bigger bulbs have a better chance of coming through the first winter with a good supply of reserves for flowering. Look for firm, healthy bulbs that have at a least a 4 inch (11 cm) circumference. Most packaged tulip bulbs sold in bulk and online will indicate the size of the bulbs you are buying. 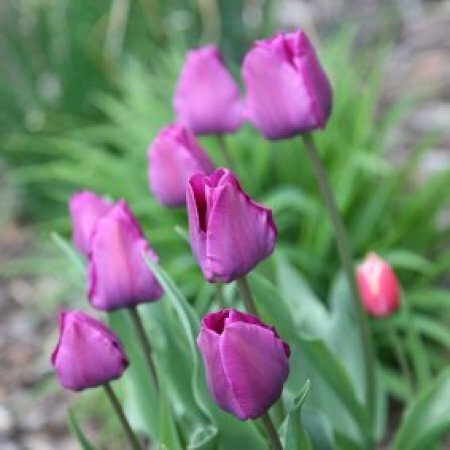 Look for "species" or "botanical" tulips rather than the big hybrid varieties. These tulips are essentially the same as (or at least close to) the tulip species found in the wild. Although somewhat shorter in height, their foliage and flowers are equally as spectacular. They are true perennials and much easier to naturalize than their "temporary" hybridized counterparts. If you live in an area with warm winters, choose cultivars which are proven to do well in warmer climates. Plant them in full sun and fast-draining soil. Although often associated with the Netherlands, tulips are actually native to cool mountainous regions where the sun's rays are less filtered by the atmosphere and falling rains drain away quickly. If you have heavy soil, amend it with lots of organic matter to improve drainage. Slopes and rock gardens make good sites-the sunnier the better. Don't plant your tulips too late. Bulbs need a long period of cold temperatures to flower. It's also important to get them into the ground before it freezes to give them enough time to develop a good root system. A good rule of thumb is to get them into the ground right after the first killing frost. Plant your tulip bulbs deep enough-usually at least 6 to 8 inches from the top of the hole to the bottom of the bulb. Cover the planting with several inches of mulch in case of a lack of snow cover. Damage to shallow planted bulbs due to a lack of winter cover is one of the most common reasons tulips fail to flower. Fertilize them or they will run out of "gas". Fertilize annually in the fall with a fertilizer formulated especially for bulbs, or a low-nitrogen fertilizer (like well-rotted cow manure). If you forget to fertilize in the fall, you can use a fast-release, high-nitrogen fertilizer in the spring when the shoots first appear. If plants are close to flowering though, you are better off skipping it altogether. Don't fertilize other plants growing in the same beds until your tulips have flowered and the foliage has died back. Tulip bulbs are native to regions where winters are cold, springs are long and cool, and summers are warm and dry. To mimic their native conditions, bulbs need a long period of cold dormancy (vernalization) to trigger flowering. Gardeners in warmer zones (Zone 5 or higher), should avoid planting bulbs near structures that may reflect heat and shorten the chilling period (e.g. concrete or asphalt), or plant pre-chilled bulbs. Allow your tulips' leaves to die back naturally before cutting them down. The leaves are the plants' food-producing solar panels, and they need as much time as possible to store food for next year's growth. Remove spent flower heads as soon as they start to fade. This will prevent the plant from wasting energy on trying to produce seeds.